Princess Cruises is a cruise line owned by Carnival Corporation & plc. The company is incorporated in Bermuda and its headquarters are in Santa Clarita, California. It was previously a subsidiary of P&O Princess Cruises, and is part of Holland America Group, which controls princess cruises brand. The line has 17 ships which cruise worldwide and are marketed to both American and international passengers. The company was made famous by The Love Boat TV series, in which its ship, Pacific Princess was featured. In May 2013, Royal Princess became the flagship of Princess Cruises; she was followed by two sister ships, Regal Princess in May 2014 and Majestic Princess in the spring of 2017, with three more ships of the class under construction. Princess also states that they will become industry leaders upon the launch of their new LNG powered vessels. Princess Cruises began in 1965, when founder Stanley McDonald chartered Canadian Pacific Limited's Alaska cruise ship Princess Patricia for Mexican Riviera cruises from Los Angeles during a time when she would have usually been laid up for the winter. However, Princess Pat, as she was fondly called, had never been designed for tropical cruising, lacking air-conditioning, and Princess ended her charter in favor of a more purpose-built cruise ship Italia. In 1969, Princess Italia was used on Alaskan cruises from San Francisco, but by 1973, the charter was canceled, and Italia returned to Europe on charter to Costa Cruise Line. Princess's third charter ship was none other than Costa's Carla C. Originally, Compagnie Générale Transatlantique's SS Flandre, the ship had been purchased by Costa in the late 1960s and given a major rebuilding. Almost immediately after completion, the ship was chartered to Princess, and it was on board the ship, which was marketed as, but again not officially renamed, Princess Carla, that Jeraldine Saunders wrote the first chapters of her nonfiction book The Love Boats. Britain's Peninsular & Oriental Steam Navigation Company (P&O), which by 1960 was the world's largest shipping company, with 320 oceangoing vessels, acquired Princess Cruise Lines in 1974 and their Spirit of London (originally to have been Norwegian Cruise Line's Seaward) was transferred to the Princess fleet, becoming the first Sun Princess. The two ships that were to be featured heavily in the television series The Love Boat were built in 1971 at Nordseewerke for Flagship Cruises and originally named the Sea Venture (for the original Sea Venture, the 1609 wreck of which resulted in the settlement of Bermuda) and Island Venture. In 1974, P&O purchased them for their Princess division, and they served as Island Princess and Pacific Princess respectively. The first P&O Princess Cruises purpose-built cruise ship was Royal Princess in 1984, the largest new British passenger ship in a decade, and one of the first, if not the first, ships to completely dispense with interior cabins. The ship served in P&O Cruises fleet as Artemis until 2011. The Swan Hellenic Cruiseship Minerva II, originally built as the Renaissance Cruises R8 was renamed Royal Princess in 2007 after an extensive refit during a drydock in Gibraltar. In 1986, P&O Princess Cruises acquired Tour Alaska, which operated on the Alaska Railroad. Based in Anchorage, Alaska, Princess Tours now operates ten luxury railcars with full-service scenic tours of Denali (formerly Mount McKinley) and can accommodate over 700 passengers per day. P&O Princess Cruises acquired Sitmar Line in 1988 and transferred all of its major tonnage to Princess, including three cruise ships then under construction. Dawn Princess and Fair Princess were both ex-Cunard, and the former Sitmar Fairsky became Princess's Sky Princess. The first of the three new Sitmar ships came into the Princess brand in 1989 as Star Princess, the largest British exclusively cruising ship. Two 70,000 grt cruise ships entered service in 1990 as Crown Princess and Regal Princess, bringing Princess's fleet up to ten deluxe cruise ships. Princess Cruises was involved in litigation with General Electric in 1998 over consequential damages and lost profits resulting from a contract the two parties entered into. General Electric was to provide inspection and repair services upon the SS Sky Princess. Upon noticing surface rust on the turbine rotor, the vessel was brought ashore for cleaning and balancing, but good metal was unintentionally removed. This destabilized the rotor, forcing Princess Cruises to cancel two 10-day cruises while additional work was performed. Princess originally prevailed, being awarded nearly $4.6 million. On appeal, however, the judgement was reversed in favor of General Electric, and Princess Cruises only recovered the price of the contract, less than $232,000. On October 23, 2000, the Peninsular & Oriental Steam Navigation Company (P&O) spun-off its passenger division to form an independent company, P&O Princess Cruises. 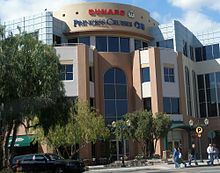 In 2001, Princess Cruises headquarters moved from Century City to Santa Clarita, California. P&O Princess Cruises merged with Carnival Corporation on April 17, 2003, to form the world's largest cruise operating company in a deal worth US$5.4 billion. As a result of the merger, Carnival Corporation and P&O Princess were integrated to form Carnival Corporation & plc, with a portfolio of eleven cruise ship brands. It is a dual-listed company, registered in both the United States and the United Kingdom, with the former P&O Princess Cruises being relisted as Carnival plc, more commonly known as Carnival UK. As an American-based company, executive control of Princess Cruises was transferred to Carnival's American operations, with Carnival UK taking control of Southampton-based Cunard Line. Princess and Cunard have offices at Carnival's head offices in both the United States and the United Kingdom. On April 3, 2008 Micky Arison, the chairman of Carnival Corporation & plc, stated that due to the low value of the United States dollar, inflation and high shipbuilding costs, the company would not be ordering any new ships for their U.S.-based brands (Princess, Carnival Cruise Line and Holland America Line) before the economic situation improves. In May 2010, Carnival Corporation & plc signed a contract with Fincantieri for the construction of two new 3,600-passenger royal-class cruise ships for Princess Cruises. Royal Princess entered service in 2013 and Regal Princess entered service in 2014. Majestic Princess, also built by Fincantieri, entered service in 2017. On August 26, 2013, the crew of the Caribbean Princess deliberately discharged 4,227 gallons of oil-contaminated waste off the southern coast of England. The discharge involved the illegal modification of the vessel's on-board pollution control systems, and was photographed by a newly hired engineer. When the ship subsequently berthed at Southampton, the engineer resigned his position and reported the discharge to the UK Maritime and Coastguard Agency. An investigation launched by the U.S. Department of Justice Environment and Natural Resources Division (ENRD) found that the practice had been taking place on the Caribbean Princess and four other Princess ships – Star Princess, Grand Princess, Coral Princess and Golden Princess – since 2005. In December 2016, Princess Cruise Lines agreed to plead guilty to seven felony charges and pay a $40 million penalty. The charges related to illegal discharges off the coasts of Florida, Maine, Massachusetts, New Jersey, New York, Rhode Island, South Carolina, Texas, Virginia, the U.S. Virgin Islands and Puerto Rico. As part of the agreement cruise ships from eight Carnival companies, including Carnival Cruise Line and Holland America Line, are required to operate for five years under a court-supervised environmental compliance plan with independent audits and a court-appointed monitor. The fine was the "largest-ever criminal penalty involving deliberate vessel pollution." United Kingdom The largest ship built for Princess Cruises at the time and the world's 10th largest passenger ship to date (2013); can hold 3,600 passengers. It was also the first ship to introduce Ocean medallion technology. Bermuda Sister ship to the Royal Princess, the world's 11th largest passenger ship; can hold 3,600 passengers. United Kingdom Last refurbished in 2015, Will transfer to P&O Cruises Australia in 2020. Bermuda Fire swept through berths in 2006; last refurbished in 2017.Will transfer to P&O Cruises Australia in 2021. Bermuda Last refurbished October 2018. These two ships each have a capacity of 1,970 passengers and 895 crew. These two ships each have a capacity of 1,990 passengers and 924 crew. Bermuda Sailed as P&O Adonia from 2003 to 2005. This ship has a capacity of 680 passengers and 373 crew. TBA TBA 2023 Fincantieri 2023 175,000 tons TBA First Princess Cruises ship to be powered by liquefied natural gas. Princess Patricia (1965–1966) First Princess ship in the fleet. Built 1949, scrapped in Taiwan, 1995. Princess Italia (1967–1973) Between 2002 and 2010, sailed for Louis Cruise Lines as the MS Sapphire. She was sold for scrap in 2012. Princess Carla (1968–1970) Former SS Flandre of the French Line. Owned by Costa Cruises and marketed as the Princess Carla while under charter to Princess, though never formally renamed. Later sold by Costa to Epirotiki Lines and renamed Pallas Athena. She was sold for scrap after being destroyed by a fire in 1994. Island Princess (1972–1999) Sailed for Voyages of Discovery between 2002 and 2013 as MV Discovery; Operated with Cruise & Maritime Voyages under the same name, before being scrapped in 2014. Pacific Princess (1975–2002) Since 2008, sailing for Quail Cruises as Pacific; She was scrapped in 2013. Known for being featured on the TV show The Love Boat. Royal Princess (1984–2005) From 2005 to 2011, sailed for P&O Cruises as the Artemis. Since 2011, transferred to Phoenix Reisen and sails as the MV Artania. Fair Princess (1988–1997) Originally built for the Cunard Line as the RMS Carinthia in 1956, scrapped in Alang, India, 2005. Dawn Princess (1988–1993) First sailed as the RMS Sylvania for Cunard Line in 1957. Scrapped in Alang, India, 2004. Sky Princess (1988–2000) Last sailed for Pullmantur Cruises in 2011, as the Atlantic Star; she was scrapped at Aliaga, Turkey in 2013. Star Princess (1989–1997) (1997-2003) Sailed for P&O Cruises as MV Arcadia. since then Sailed for Ocean Village as the Ocean Villagefrom (2003-2010). In 2010, transferred to P&O Cruises Australia and sailed as the MV Pacific Pearl until 2017 when she was sold to Cruise & Maritime Voyages and renamed MV Columbus. Crown Princess (1990–2002) Between 2004 and 2009, sailed for Ocean Village as the Ocean Village Two. In 2009, transferred to P&O Cruises Australia and sails as the Pacific Jewel. Regal Princess (1991–2007) Since 2007, sailing for P&O Cruises Australia as Pacific Dawn. Golden Princess (1993–1996) Since 2005, sailing for Fred. Olsen Cruise Lines as MV Boudicca. Ocean Princess (2000–2002) Since 2002, sailing for P&O Cruises as the MV Oceana. Royal Princess (2007–2011) Since 2011, sailing for P&O cruises for 4 years, 2015 MV Adonia will be sailing for Fathom Cruise Lines as the MV Adonia. After Fathom ceased operations, Adonia was transferred back to P&O cruises in June 2017. However in early 2018 she was sold to Azamara Club Cruises and became the Azamara Pursuit. Ocean Princess (2002–2016) Previously R Four and Tahitian Princess. Transferred to Oceania Cruises In March 2016 to become the Sirena. ^ "2018 World Wide Market Share". Cruise Market Watch. 2018-01-05. ^ "Contact Us". Princess Cruises. Retrieved on January 20, 2010. ^ "Princess Cruises finalises order for two LNG ships with Fincantieri". CruiseandFerry.net. Retrieved 2019-04-02. ^ Fabio Pozzo (31 July 2013). ""Love Boat", the dream ship will continue to browse only on TV" (in Italian). La Stampa. Retrieved 12 April 2018. ^ "Princess Cruises Renews Lease | San Fernando Valley Business Journal". Retrieved 2019-02-04. ^ "No newbuildings for Carnival's US brands at current dollar-euro rate - Arison". Cruise Business Review. Cruise Media Oy Ltd. 2008-04-04. Archived from the original on September 22, 2008. Retrieved 2008-04-03. ^ "Carnival Corp. finalizes contracts for two new Princess ships". Cruise Industry News. 4 May 2010. Retrieved 4 May 2010. ^ "Fincantieri to build two prototype ships for Princess Cruises". Cruise Industry News. 17 February 2010. Retrieved 17 February 2010. ^ "The $40m 'magic pipe': Princess Cruises given record fine for dumping oil at sea". The Guardian. December 2, 2016. Retrieved December 3, 2016. ^ Martin, Hugo (December 1, 2016). "Princess Cruises to pay $40-million fine for dumping oily waste and lying about it". Los Angeles Times. Retrieved December 3, 2016. ^ "Carnival's Princess Cruises to pay record fine for pollution, cover-up". CBS News. December 2, 2016. Retrieved December 3, 2016. ^ Rogers, Katie (December 2, 2016). "Princess Cruise Lines to Pay $40 Million Fine for Illegal Dumping". The New York Times. Retrieved December 3, 2016. ^ Flechas, Joey; Herrera, Chabeli (December 1, 2016). "Carnival Corp ship caught in pollution scheme. Now they're paying $40 million for it". Miami Herald. Retrieved December 3, 2016. ^ Sloan, Gene (December 1, 2016). "Princess Cruises to plead guilty to polluting ocean". USA Today. Retrieved December 3, 2016. ^ a b "Princess Cruise Lines fined $40m for waste dumping after UK tip-off". BBC News. December 1, 2016. Retrieved December 3, 2016. ^ Dennis, Brady (December 2, 2016). "'Magic pipe' used to spew oily waste into water: Princess Cruises to pay record-breaking fine for pollution". Calgary Herald. Archived from the original on December 3, 2016. Retrieved December 3, 2016. ^ "Princess Cruises Announces Name of Next New Ship Will Be Regal Princess - Cruise Industry News | Cruise News". Cruise Industry News. 2012-08-28. Retrieved 2013-03-02. ^ Bond, Mary. "Majestic Princess heading for Taiwan homeporting season". Retrieved 2018-08-14. ^ "Carnival Corporation Finalizes Contracts with Fincantieri to Build Five New Cruise Ships". Retrieved 2016-04-01. ^ a b "Princess to Build Two 175,000-Ton LNG Ships at Fincantieri". Cruise Industry News. 2018-07-23. Retrieved 2018-07-30. ^ "Princess Cruises Orders Two Mega Cruise Ships, Their Largest Yet". cruisefever.net. Retrieved 2018-07-31. Wikimedia Commons has media related to Princess Cruises.